File a lien claim with this Statement of Lien form for Maryland contractors, subcontractors and suppliers. The Statement of Lien must be completed and filed to claim a lien for goods, labor or services provided for improvements to the property named in the Statement, in accordance with Title 14, Subtitle 2 of the Real Property Article, Maryland Annotated Code. The form includes a copy of Subtitle 2 giving instructions on how to file a lien claim. Buy the form once, and it's yours to use as often as you require. 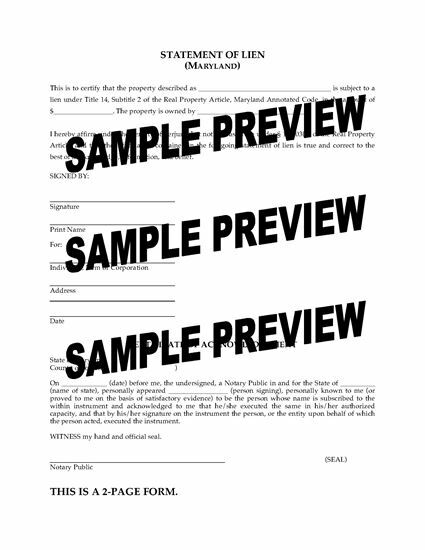 Download the Maryland Statement of Lien form, fill it in, file and serve it so you can get paid for your work.